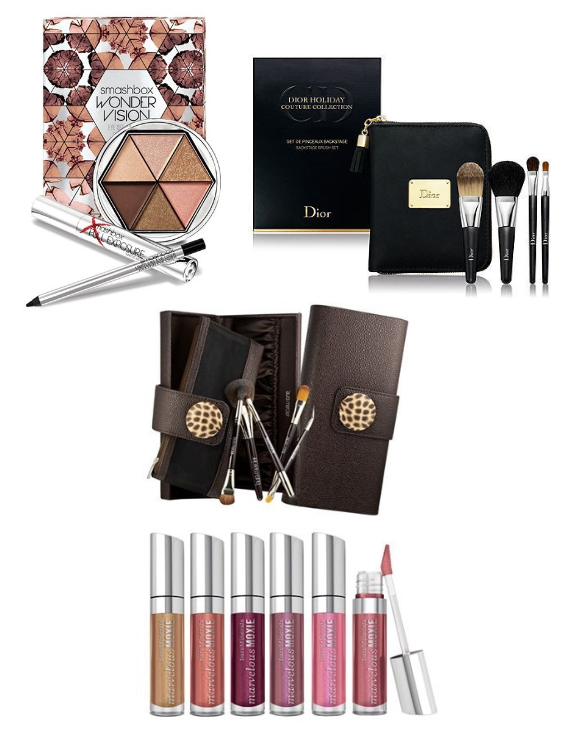 Nordstrom Beauty has hundreds of holiday items and exclusives to find the perfect last-minute gifts. You'll find limited-edition sets and unique gifts from all your favorite brands from cosmetics and skincare to fragrances and hair care. 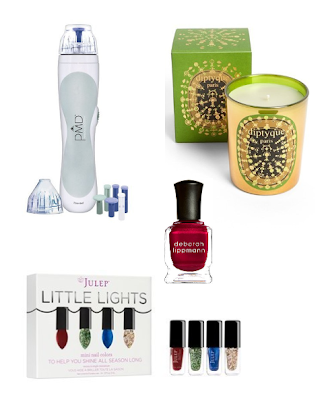 Here are some of my top picks that you'll find in-store and online at nordstrom.com. The Smashbox Wondervision Eye Kit, $32 ($72 value) is available in three different eyeshadow palettes (bronze/gold, smoky/blue or pinks/pewters) plus a Limitless Waterproof Eyeliner in Onyx and Full Exposure Mascara. These portable palettes contain gorgeous pigmented colors in matte to metallic finishes. I am so excited to have finally found a great travel brush set with Dior's Couture Collection Backstage Brush Set, $65. The quartet of mini brushes include fluid foundation, powder foundation, eyeshadow and lip brushes. I love brush sets that also feature a chic clutch, like the Laura Mercier Travel Brush Collection, $125 ($266 value). It comes nine brushes and a removable magnetic mesh bag. The brushes are also labeled - Cheek Colour, Secret Camouflage/Camouflage Powder, Ponytail/All Over Eye Colour, Smudge/Crease and Angled Eye Liner/Flat Eye Liner. One product I make sure I am always stocked up on at home, in my bag and at the office is lip gloss to wear alone or over lipstick. Lip gloss sets like bareMinerals Show Me The Shimmer Set, $25 ($54 value) are perfect for splitting up into stocking stuffers, sharing with a friend or two, or keeping all to yourself. This set of mini lipglosses will keep your lips moisturized, and include a wide range of shades - Crowd Pleaser (a golden vanilla glimmer), Femme Fetale (a glistening cabaret), Head Turner (a soft pink glitz), Icon (an amber pink glimmer), Scene Stealer (an electric lilac sparkle) and Superstar (a holographic teal prism). One of my favorite stocking stuffers to gift is L'Occitane hand creams, which you will always find in my bag. 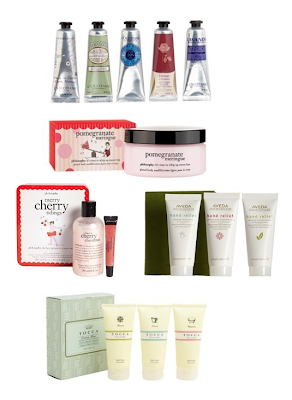 I love the variety of scents that are included in the L'Occitane Hand Creams of Provence Set, $42 ($60 value) - Cherry Blossom (soft and floral), Almond Delicious (fresh and mouthwatering), Shea Butter (#1 best-seller), Rose 4 Reines (feminine and floral) and Lavender (soothing and relaxing). 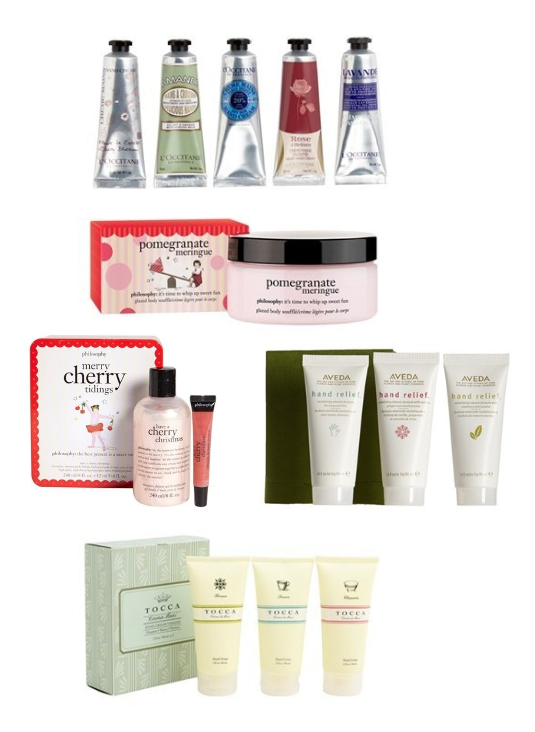 philosophy has some amazing, delicous scents this season, like philosophy's Pomegranate Meringue glazed body souffle, $22 and Merry Cherry Tidings, $20, a Nordstrom Beauty exclusive featuring Have a Cherry Christmas Shower Gel and Have a Cherry Christmas Lip Shine. Another favorite hand cream set is Aveda Give Soft Hands Gift Set, $27, which comes packaged in handcrafted lokta-bark paper from Nepal and contains three travel-sized hand reliefs in Original, Holiday and Rosemary Mint (love this one!). Tocca 'Crema Mani Viaggio' Hand Cream Trio, $20 ($24 value) is made with a blend of coconut oil, shea butter and aloe, leaving your hands feeling super soft and moisturized. Scents include Cleopatra, Florence and Bianca. The PMD Personal Microderm Device, $179 (currently $139 - 20% off) is the perfect gift to treat yourself or your gift recipient to a microdermabrasion-at-home experience. This unit will help you remove dull aging skin and reduce the appearance of fine lines, wrinkles, enlarged pores and blemishes. It uses the same aluminum oxide crystals embedded in the top that are used in ten thousand dollar machines found at your doctor's office. It can be used on your face, elbows, hands, feet or wherever you have age spots, fine lines, or wrinkles. One of my go-to brands for candles is Diptyque, known for their luxurious fragrances. I am crazy over their Pine Bark Candle, $68, part of their Holiday Candle Collection this season. This beautiful candle features a clean, woody, smoky fragrance that combines notes of pine and cedar with hinoki, a Japanese cypress. It's the perfect scent to get you in the holiday spirit. Deborah Lippmann 'Silks' Nail Color, $19 each, is available in Red Silk Boxers, Harem Silks From Bombay and Pseudo Silk Kimono. These nail colors have a gorgeous matteen finish with a texture reminiscent of silk. I've been obsessing over Julep lately and the Julep Little Lights Nail Color Set, $20, a Nordstrom Beauty exclusive, is great stocking stuffer choice. This set of mini nail colors includes Paris (a multidimensional glitter holographic top coat), Ivy (a sapphire micro-glitter metallic), Colbie (a full coverage citrine green multidimensional glitter) and Jameson (a vibrant fire red créme). I already own the Paris nail color from another Julep set and love using it to accent my nails. When you shop online at shop.nordstrom.com, you'll get free delivery by Christmas Eve, for most items ordered by 3pm EST on 12/23. How amazing is that?! Good luck with your holiday shopping!